The small city of North Bend, Washington, has a population of just under 6,000 residents. It is one of the easternmost cities in King County, just north of an entrance to Mount Rainier National Park. The city of Seattle is 30 miles west; the closest neighboring cities are Snoqualmie and Tanner. North Bend is perhaps best known as the filming location for the popular television series “Twin Peaks”. It is also well known, especially by locals, as an unrivaled hiking spot; Mount Si and Little Si are located just north of the city and attract thousands of visitors every year. 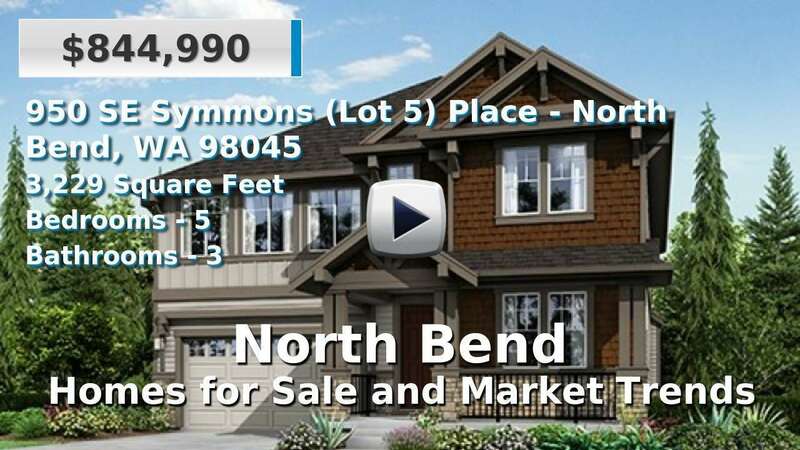 This is a very rural area outside the large metro area of Seattle-Bellevue; homes for sale in North Bend offer plenty of space and mountain or river views. 4 Beds | 3.25 Baths | 5350 sq. Ft.
5 Beds | 3.25 Baths | 3184 sq. Ft.
3 Beds | 2 Baths | 2750 sq. Ft.
3 Beds | 2.25 Baths | 1823 sq. Ft.
3 Beds | 2.5 Baths | 2430 sq. Ft.
3 Beds | 2.5 Baths | 2300 sq. Ft.
3 Beds | 1.75 Baths | 1724 sq. Ft.
3 Beds | 2.5 Baths | 1840 sq. Ft.
3 Beds | 1.5 Baths | 1212 sq. Ft.
4 Beds | 2 Baths | 3004 sq. Ft.